Don’t be intimidated by these 6” finished blocks! Karen Walker specializes in ‘Piecing Tiny Pieces’ and shares her techniques and tips to successfully tackle each block using modern rotary cutting and piecing methods! Unlike the book, very few templates are used! Choose either a 6- or 12-month class. We will plow through approximately 10 blocks each class. At the end of Class 6, you will have pieced enough 6” blocks to create a beautiful lap quilt. Want to go the distance? Continue your farm journey for an additional 6 months completing all (111) 6” blocks resulting in an heirloom queen size quilt! Begin with a free ‘prep class’ on January 23, 2019 from 1:00pm-2:00pm. This prep class teaches the importance of how to prepare fabric before the first cut is made as well as how to properly cut fabric. These tips are extremely important when ‘Piecing Tiny Pieces’! Learn ways to organize your farm blocks as you prepare for each class. Discuss fabric choices; colors and contrast. You will receive cutting instructions for Class 1, beginning February 13, 2019 from 1:00-5:00pm. All additional classes will meet from 1:00-5:00pm on the second Wednesday of each month ending on July 10, 2019 which concludes the 6-month Class period. For those who want to keep getting their hands dirty…get your hoe sharpened! Class 7 begins September 11, 2019 from 1:00-5:00pm, meet the second Wednesday of each month through February 12, 2020. *Note: Class 1-6 is a prerequisite for beginning the second half of the Farmer’s Wife journey. Each class cost $35 and includes emailed pdf downloads of each lesson. Lessons will be emailed roughly one month in advance so cutting of all blocks can be done prior to class. 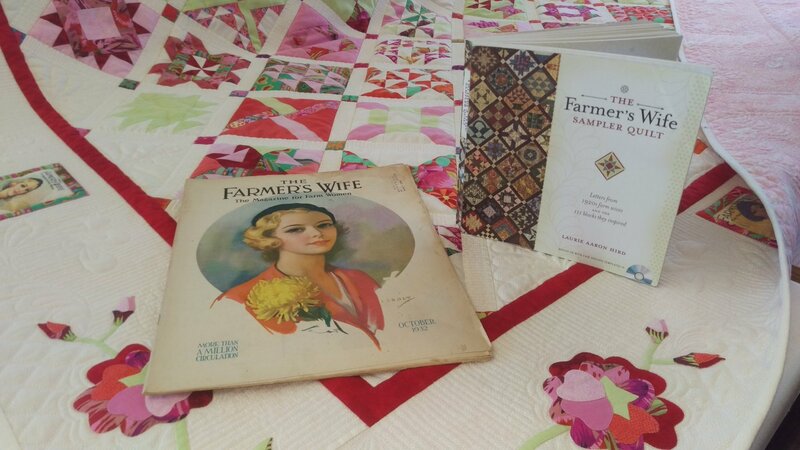 Come join the Farmer’s Wife Monthly Journey!